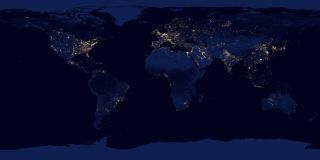 Now you can see all of the country's nighttime lights in a single high-def image that allows users to zoom in and see tiny details of the so-called "Black Marble" view of Earth. The zoomable image was made with technology from a company called Gigapan in conjunction with NASA's Earth Observatory. It's an enhanced version of one released on Dec. 5 by NASA and the National Oceanographic and Atmospheric Administration (NOAA), which shows what the planet looks like when the sun goes down. It is made up of several photographs taken by an instrument aboard the Suomi NPP satellite in recent months. In the augmented version, users can zoom in and leave comments about various locations on the image. It also allows users to see some remarkable contrasts, like the bright lights of South Korea and the darkness of its neighbor, North Korea. The satellite sensor, the day-night band of the Visible Infrared Imaging Radiometer Suite (VIIRS), is primarily intended to capture detailed data about cloud, snow and ice formations during nighttime hours. The VIIRS instrument is sensitive enough to detect the nocturnal glow produced by Earth's atmosphere and the light from a single ship in the sea, according to a NASA release. In the image, lights from ships and oil platforms can be seen offshore. The amount of ship traffic is stunning, especially in areas like Southeast Asia. Before 1973, pictures of America's nighttime lights were classified by the military, but since then, NOAA's National Geophysical Data Center has been processing the images to examine population and urbanization changes around the planet, along with helping to pinpoint electrical power blackouts in the United States.